Griffith gets attacked by a giant rat. Also, Nomad joins us for a chat from the comfort of his automobile. In this episode, we talk about less prominent characters in the series, including Zepek, Zondark, Boscone, and Mozgus' crew of outcasts. We also conduct a "live" viewing of the new Berserk movie dub trailer, and talk about the third movie trailer, and what that means for the end of this movie trilogy. Walter rants about Dark Souls and why you should be playing it instead of listening to this, and what our favorite console controllers are. PS: Our longest episode ever. Are you going to turn into Splinter Griff? Good thing you didn't get bitten by it. favorite controller would be the Dual Shock. Peace Walker is a nice game, the last one I enjoyed better than MGS4. Wow... I wasn't aware I had that much static. Somehow, there was a delay, because I tend to talk on top of someone when in my time, I didn't hear anything. So my apologies. But as always, thank you for having me and for the fun hours. Overall a great episode. Had fun recording with you guys. Great episode! My favorite part was the rat attack incident, I was laughing throughout the whole section. It wasn't a funny incident but your discussion of it certainly was. Agreed. Awesome story! I can has more story time with Griff? Enjoyed the podcast. Also, Nomad! chill out with your podcast music deadline! Your music/clips are always worth it. Life happens - it's all good. Heh heh, thanks man. It's more of a frustration of wishing or wanting to work on them and not having enough time to do them. The best analogy would be wanting to play a long waited video game, and just being able to nit-pick here and there. I love doing these things and hopefully the wait will be worth it ;). On a side note... I think it's safe to say that SK.NET will now officially hear that Aazealh is actually not a machine! And we are able to rejoice in this slight moments of emotion after finding out that the MG HD Collection is also in the Xbox 360! I second that. Nomad, it has become something of a ritual for me to restart the podcast 5-6 times before actually listening to it, in order to hear the intro music again and again. And when I first heard 'Serpico', I thought Walter took it from an actual video game or movie soundtrack (I have listened to the 21 podcasts in a very mixed order, and missed the intro walt made for your track in an earlier podcast.) Btw, I recently heard your 'Hill of Swords' piece. Blown away. Keep em coming! Great episode. The part where you all watched the dub trailer and the comments that accompanied it was my favorite. Neat idea! I really believe you should do more of these in future podcasts. You know - not necessarily in every episode... but every once in a while would be amazing. 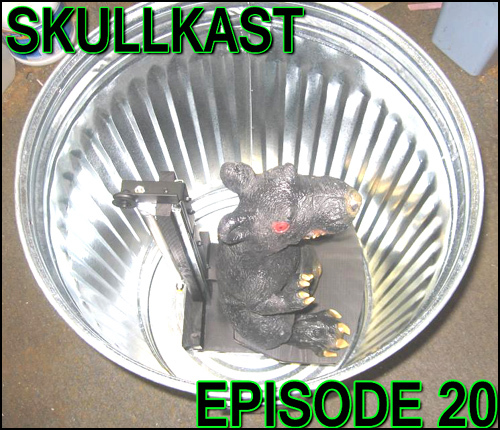 Also, I would like to point out that SkullKast probably has a bigger audience than you guys might think. I was pleasantly surprised when I learned that two of my acquaintances from my university class actually download and listen to Sk.net podcasts, since both of them are pretty 'casual' readers of Berserk and generally aren't too much into the whole 'participating in forums' thing. Let's hope that your discussing of the manga has opened their eyes about how much of a masterpiece Berserk really is... their casual and 'just another manga' approach to Berserk enrages me! Yep. The audience isn't that big, a few hundred. But it's grown over time. The most we ever had was the special movie review episode—it quadrupled for that one. But really, I don't concern myself with the numbers much. If Berserk fans want to hear it, they will seek it out. I enjoy talking with these guys every few weeks, so I'd do it if there were even 10 regular listeners. I was pleasantly surprised when I learned that two of my acquaintances from my university class actually download and listen to Sk.net podcasts, since both of them are pretty 'casual' readers of Berserk and generally aren't too much into the whole 'participating in forums' thing. Hey, that's nice, casual readers... Hope they enjoy the show too! I understand the reluctance to post in forums; I'm not big into that myself (SK.net being the exception). That being said if they registered they could ask Berserk-related questions to help deepen their understanding of the series. This just occurred to me because while we do get a lot of questions about our personal tastes and such, I feel we get comparatively few questions about the series itself than we do on the forum proper. I enjoy talking with these guys every few weeks, so I'd do it if there were even 10 regular listeners. Hehe yeah, I wouldn't mind if it weren't even recorded. I won't be available to record this week. I'll be out of town, visiting relatives for one of the last trips before baby arrives. But you guys can maybe beg the other admins to sit down and record on Sunday. But you guys can maybe beg the other admins to sit down and record on Sunday. Yeah I'm sure that'll work! I'm just so eager to record, I won't be able to stop myself! I'm looking for a guest to be on the podcast this Sunday afternoon to fill a slot. If anyone is interested in being on, PM me and let me know if there's a specific Berserk subject you'd like to discuss on the show.